Last week, Apache released its major version of JMeter called Apache JMeter 3.0 with lots of enhancements and features. Last week, Apache released its major version of JMeter, called Apache JMeter 3.0, with lots of enhancements and features. It was a long wait since JMeter 2.13. In this article, we are going see about noteworthy features of Apache JMeter 3.0. Firstly, there was a major revamp done in the JMeter GUI. Icons have been redesigned, and importantly, the JMeter logo was updated. A poll was conducted and the team decided on the final JMeter logo as shown below. Below is the GUI for JMeter 3.0. Note the icons and a few extra objects in the top right corner. View Results Tree got a Search option where you can search for a string with regular expressions and case sensitive options. If you are working with modern web stack applications like AngularJS, ReactJS, etc., then you need to use a JSON processor. JMeter 3.0 has a dedicated JSON extractor called JSON Path PostProcessor which is same as the Regular Expression Extractor. Below is a glimpse of XPath and JSONPath syntax. @ n/a attribute access. JSON structures don’t have attributes. HTTP sampler and HTTP Request defaults have an advanced tab where you can set the options below. Now you can generate dynamic graphs in an HTML report using APDEX. By installing Grafana and InfluxDB, you can generate beautiful charts and graphs. There is a migration to HTTPClient 4.5.2 which is not completed yet. Upon completion, there will be lots of improvements in JMeter. A new pre-processor called Sample Timeout has been introduced. This will apply a timeout to any samplers which are in scope. By default, it is 10 seconds. You can use a DBCP2 pool in your JDBC request sampler. Thread Group right click has more options: Start no pauses and Validate. Also, you can assign shortcuts and there is a shortcut to expand nodes. Are you a Groovy scripter? You can use it immediately in JMeter through JSR223 elements. 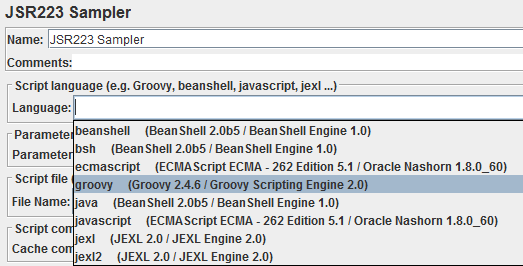 You can download the latest version of JMeter in here http://jmeter.apache.org/download_jmeter.cgi. It requires Java 7 or later. Please make a backup before upgrading. Published at DZone with permission of naveenkumar . See the original article here.